On November 7, H.E. Mme. 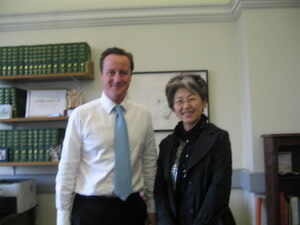 Ambassador Fu Ying came to the parliament and met David Cameron, leader of the Conservative Party. They had a friendly conversation. Cameron denoted that all circles of UK and the Conservative Party paid close attention to the 17th CPC Congress. They were eager to know some information about the congress so as to have a better understanding of the future of China. Fu Ying introduced the 17th CPC National Congress and the report of General Secretary Hu Jintao in details and emphasized that China would adhere to the reform and opening up and stick to the road of peaceful development. Fu Ying also introduced the theories of socialism with Chinese characteristics, the concrete contents of the goal of ensuring people a relative prosperous life and the scientific outlook on development. She denoted that the development of China would provide new opportunities for Sino-UK relationship, including the relationship between parties of the two countries. Cameron thanked the introduction of Fu Ying and denoted that he was extremely interested in having a deep understanding of China. He hoped to have the chance to visit China and exchanges opinions with the Chinese side on Sino-UK relationship and the international issues. Cameron expressed his intent of actively promoting the Sino-UK cooperation in environmental protection. Fu Ying introduced bilateral cooperative projects as Dongtan Eco City of Shanghai, proposed Sustainable Development Research Institute and environmental governance in the central provinces. She denoted that China was facing a lot of challenges in the sector of environmental protection and China welcomed UK to provide technologies and experiences. Cameron also denoted that the Conservative Party and he himself were willing to play an active role in promoting Sino-UK cooperation in economy, trade and education, expanding the investment of China in UK and holding a successful Olympic Games in Beijing. Fu Ying expressed her appreciation. The Conservative Party is one of the major parties in UK and has been in the saddle for a long time. It has been an opposition party since 1997, Cameron was elected Conservative Party Leader in December 2005.